Wat is dit voor site? Wij zoeken de goedkoopste boeken op internet. Access, Quality and Satisfaction with Carevonden we het goedkoopst op Bol.com voor €98.99. We hebben gezocht in nieuwe en tweedehands boeken. Rechtsonderaan de pagina kan je het boek direct bestellen	via Bol	.com. Traditionally in health services research, cost, quality and access to care have been viewed as the three major issues of health care delivery and have been important in the development of health services research as a multidisciplinary way to examine issues in health care and health care delivery. Satisfaction is often viewed as a specialized aspect of access to care. Given the sociological focus of this volume, costs are less of a focus, but access, quality and satisfaction are important sociological aspects of health services delivery concerns and have been for more than 30 years. This volume explores a variety of those issues in today's health care system, with a strong sociological focus. 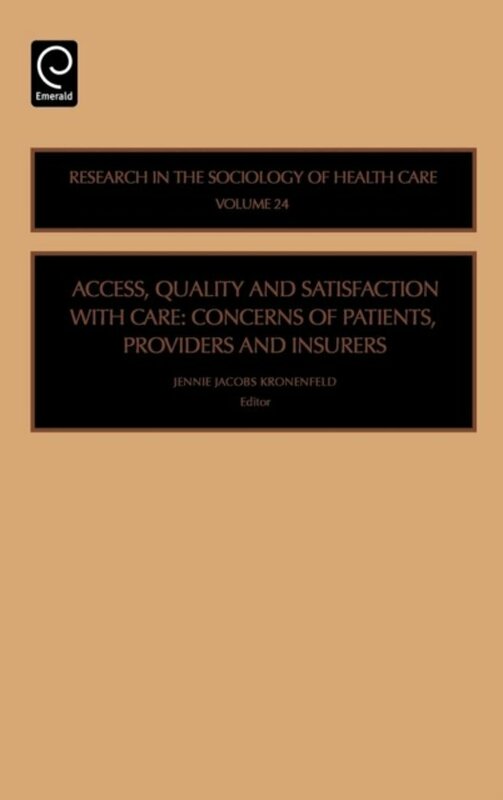 Besides the introductory section of the volume, the other sections of the volume focus on articles that are about patients and special types of care, elderly care issues, issues of access, quality and satisfaction with care from the perspective of foreign health care systems, and these issues in public systems of care. Some of the specific chapters look at issues of care for Vietnam veterans, patients with myocardial infarctions, and dental care and maternity care, elderly care issues, and what can be learned from explorations of some aspects of the health care systems of Canada and Hungary. Access, Quality and Satisfaction with Care is essential reading for medical sociologists and people working in other social science disciplines studying health-related issues. The volume also provides vital information for health services researchers, policy analysts and public health researchers. It looks at health care from a sociological perspective that is more focused on access, quality and satisfaction than cost. The chapters focus on specialized forms of care and specific issues (i.e. Vietnam Veterans, dental and maternity care, elderly care issues, health care systems in different countries, etc.). It is essential for medical sociologists and others in social science industries studying health-related issues. Auteur J. Jacobs-Kronenfeld J. | Jacobs-Kronenfeld J.